Thilakan is an unhappy man these days. He has been making provocative statements about both Mammotty and Mohanlal as well as others like Nedumudi Venu. 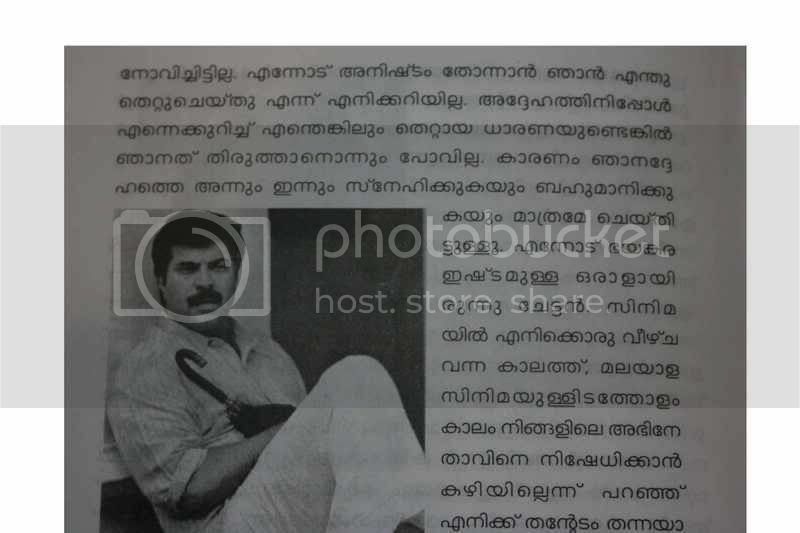 And here is what the superstars had to say about Thilakan. Mammooty writes the following in his autobiography. 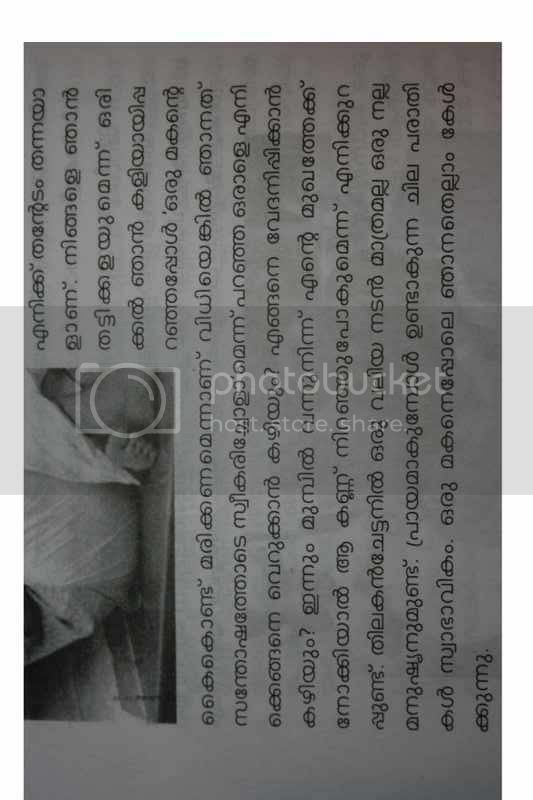 For guys like me who can’t read Malayalam, can you explain the Mammooty’s book excerpt? Thilakan seems to be accusing almost all of the actors, which makes his arguments less credible. I don’t think religion or community plays any role in a movies success. The latest grouse from Thilakan is that he wasn’t even informed about AMMA’s new movie Twenty-Twenty, where almost all actors take up a role. One can almost visualise how pathetic the movie finally will be, still, avoiding a senior artist is quite sad. Balaji, Mammooty is saying that he has never hurt Thilakan, doesn’t know why the latter should be displeased with him, that he wouldn’t try to correct any wrong impression Thilakan might have about him since he has always loved and respected Thilakan. He quotes a couple of incidents showing the depth of their relationship, avers that Thilakan is a great human in addition to being a great actor, and that such complaints one might have in old age are natural and that he hears them all like a son ( would ). Recently I heard in an interview in Kairali that the christian brother movies producer, Maha Subair confirmed that someone had told him to ban Thilakan from acting in movies. Is this true? If it is, then why isnt Amma getting involved and resolving these issues???? This is AMMA’S duty to confirm that such things do not happen in the film industry. I’m sure the person who asked to ban Thilakan is none other than the super star loosers in kerala – Mammooty or Mohanlal. Why is everyone in the film industry dancing around their fingures??? Its sad to see that so many amazing talented artists out there do not get chance in acting because these super stars play internal politics to avoid them. To blame superstars is easy. They have become because of their struggle,hardwork and talent ofcourse may be a bit of luck too.If a new talent comes up he ll be noted ll be compared with the current best. If he does well he is accepted and after the initial acceptance the litmus test starts -this is the time when many new finds fail to perform – as the expectations are sky high. ‘Amma’ should have pardoned Thilakan as he had replied to their notice whatever the contents be..The virtue always depicted in the films they act should have been followed.After all quarrels never end and can only lead to newer fights. It is worry factor for us when these actors fight on ‘petty’ matters in full day light.Hope wisdom will prevail and some senior star will take lead and put an end to this ‘washing dirty linen in public’. We are already sad with quite a good bunch leaving us for ever. We have not yet come out of that. So request everyone -ALL is Well- and be happy -come to solutions fast by giving into resolve .Everyone know that Thilakan has a big ego.So do something in ur filmy way to satisfy his ego without hurting anyone.But do this fast and we are getting too tired of this.